Spy Blog disagrees with several of the "correct" answers to this Quiz. If these really reflect the MI5 Security Service Intelligence Officer mindset, then there needs to be some retraining as soon as possible. N.B. if you have gone to the MI5 website, or have arrived at this Spy Blog web page through, say, a Google web search or through Twitter or a blog RSS feed and you have not bothered to take any precautions to hide or fake your computer's IP address and web browser details, cookies etc. from foreign companies and governments, then you should have, in our view, already failed the MI5 Intelligence Officer recruitment procedure. Unfortunately, we suspect that MI5 still does not take "cyber security" / privacy and anonymity as seriously as it should. 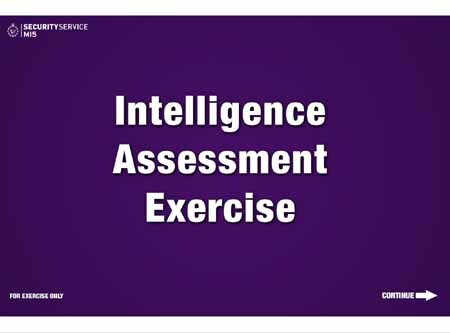 You can examine the source material and the questions (with the "correct" scores for each option) at your leisure, at our Spy Blog answers - MI5 Investigative Challenge Intelligence Officer Quiz web page. This fictional scenario involves some alleged foreign intelligence officers operating from their Embassy in London (see the Spy Blog London Diplomatic List archive). 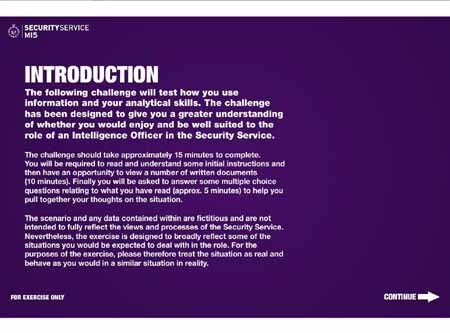 However, in real life, Counter-intelligence operations against foreign intelligence officers under "diplomatic cover" in London takes up only a small proportion of MI5's resources compared with Counter-Terrorism..
Continue reading MI5 Security Service Investigative Challenge Intelligence Officer Quiz. Address at the Worshipful Company of Security Professionals by the Director General of the Security Service, Jonathan Evans. 10. It is interesting to note in this context that in the last ten years what might be called a "zero tolerance" attitude to terrorist risk in Great Britain has become more widespread. While it has always been the case that the authorities have made every effort to prevent terrorist attacks, it used to be accepted as part of everyday life that sometimes the terrorists would get lucky and there would be an attack. In recent years we appear increasingly to have imported from the American media the assumption that terrorism is 100% preventable and any incident that is not prevented is seen as a culpable government failure. This is a nonsensical way to consider terrorist risk and only plays into the hands of the terrorists themselves. Risk can be managed and reduced but it cannot realistically be abolished and if we delude ourselves that it can we are setting ourselves up for a nasty disappointment. We agree with this, except that it is unfair to simply blame this risk aversion / "no stone unturned" / Cover My Bureaucratic Backside nonsense on the "American media". The morally weak, unscrupulous and incompetent Labour party control freaks, who were in positions of power in Government, are at least as much to blame. They were always willing to Be Seen To Be Doing Something about terrorist threats, even though they were helping to make matters worse. 11. In the investigations that we are pursuing day to day, sometimes our ability to uncover and disrupt a threat goes right down to the wire, as was the case with the airline liquid bomb plot in 2006. The plotters were only days away from mounting an attack. Sometimes it is possible or necessary to step in much earlier, though in such cases it can be hard to get enough evidence to bring criminal charges. But I would rather face criticism when there is no prosecution (often accompanied by conspiracy theories about what was supposedly going on) than see a plot come to fruition because we had not acted soon enough. Operation Pathway, the disruption of an Al Qaida cell in North West England 18 months ago, is a good example of a necessarily early intervention where criminal charges could not eventually be sustained. The case has subsequently been reviewed by the Special Immigration Appeals Commission and Mr Justice Mitting concluded that the case involved a genuine threat from individuals tasked by Al Qaida. Whilst we are committed to prosecutions wherever possible it is a sad fact that for all sorts of good reasons terrorist threats can still exist which the English criminal justice system cannot reach. The government cannot absolve itself of the responsibility to protect its citizens just because the criminal law cannot, in the particular circumstances, serve the purpose. "The government cannot absolve itself of the responsibility to protect its citizens just because the criminal law cannot, in the particular circumstances, serve the purpose." No ! This is an argument for extra- judicial punishments and for the harassment of people who should be treated as "innocent until proven guilty, on actual evidence" regardless. Where has this stupid idea been imported from ? This weasel worded paragraph tries to imply that all of the people who were arrested under Operation Pathway pose a terrorist threat, which is obviously untrue. There is also no mention of the "collateral damage" caused by the hurried arrests themselves, where at least two completely innocent people were forced to the ground at gunpoint, in public, putting their lives and those of the passing public at risk unnecessarily, before they were released without being arrested, and without any public apology or compensation. Remember that despite intensive forensic searches, no weapons, explosive or terrorist money etc. was ever found in Operation Pathway. Surely the benefit of doubt must be given to terrorist suspects, where it is not possible to catch them red handed and they should simply be be let go and kept under surveillance ? This is an acceptable risk, as per the argument outlined in paragraph 10, because otherwise there is far too much "collateral damage" to innocent people and the terrorist s will have won a victory by conning the Government and intelligence agencies into destroying our freedoms and liberties, which is precisely what the terrorists want to achieve. There is no evidence that the widely condemned house arrest and other restrictions without any trial or evidence, through the "Control Orders" scheme works at all. Jonathan Evans appears to be arguing for its continuation, and possible extension to people who have been released after having served their time in prison for terrorist related offences. Finally MI5 appears to be moving into the 21st century. 21. I would like to conclude with a brief reference to the espionage threat. Events over the summer in the United States underlined the continuing level of covert intelligence activity that takes place internationally. Espionage did not start with the Cold War and it did not end with it either. Both traditional and cyber espionage continue to pose a threat to British interests, with the commercial sector very much in the front line along with more traditional diplomatic and defence interests. Using cyberspace, especially the Internet, as a vector for espionage has lowered the barriers to entry and has also made attribution of attacks more difficult, reducing the political risks of spying. And cyber espionage can be facilitated by, and facilitate, traditional human spying. So the overall likelihood of any particular entity being the subject of state espionage has probably never been higher, though paradoxically many of the vulnerabilities exploited both in cyber espionage and traditional espionage are relatively straightforward to plug if you are aware of them. Cyber security is a priority for the government both in respect of national security and economic harm. Ensuring that well informed advice is available to those who need it, including through the use of private sector partners is, and will remain, vital. 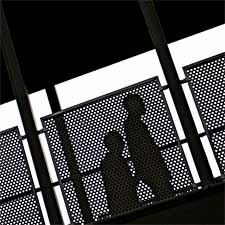 "though paradoxically many of the vulnerabilities exploited both in cyber espionage and traditional espionage are relatively straightforward to plug if you are aware of them"
Unfortunately, MI5 itself has a history of "cyber security" blunders with their public website, their public alert email system and with the activities of the likes of Daniel Houghton, all of which were "relatively straightforward to plug if you are aware of them". We have also introduced a new Freephone number (0800 111 4645) to make it easier for members of the public to contact us to report suspected threats to national security. This is in addition to our existing Public Telephone Number (0207 930 9000). N.B. the exisiting telephone number should "officially" be written as 020 7930 9000. If, as stated in the they really are trying to recruit agents and informants from overseas , as well as from within the UK, then the international dialing code prefix would also help: +44 (0)20 +44 020 7930 9000. Given how little content there is overall on the MI5 website, the "other language" versions could easily have been full translations of the whole English language website, rather than just cut down versions. More worrying, is the inconsistent, or entirely missing foreign language versions of the SSL encrypted secure web contact form. The English language secure web form, correctly, goes to an SSL encrypted web page (https://) , and then properly processes the potentially very sensitive personal details or intelligence tip off, with a server side script, again protected via SSL, even if you follow a link from the default unencrypted web pages. The Arabic version secure web form also does this correctly.. However, the Welsh language web contact form, but it does not, by default, make use of SSL encryption. (It can be made to do so, if you change "http://" to "https://" by hand). We suspect that very little use will be made of this Welsh language form, but Welsh is one of the legally defined official languages of the United Kingdom. The French, Russian, Urdu, Farsi and Chinese language versions do not bother to offer a link to a translated version. These foreign language pages even hide the navigation links to the original English version of the secure web contact form. The Chinese language version has a broken web link to what was probably former Home Secretary Jacqui Smith's official ministerial biography on the Home Office website. The Farsi version of the website has a translated contacts page, which mentions Secure Sockets Layer (spelled out in English) , but does not bother to use it. The postal address also misses out the word "Desk" from "The Enquries Desk. PO Box 3255, London SW1P 1AE "
How relevant or interesting to the rest of the world, are the relatively detailed explanations about UK legislation like UK Regulation of Investigatory Powers Act 2000 etc., which is what much of the translated versions seem to concentrate on ? There is still no MI5 Security Service published PGP public encryption key or a public email address - why not ?. 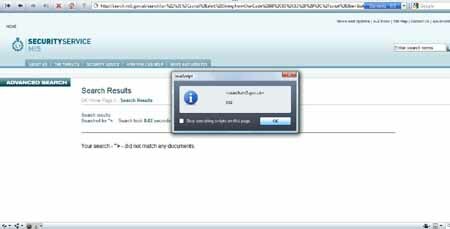 The MI5 Security Service MI5 Contacts Us web page is still much better than, that of the MI6 Secret Intelligence Service, or even the Metropolitan Police Service Anti-Terrorism Hotline contact pages (which does at least have an encrypted web form). Some of the new features such as the MI5 News and Updates RSS syndication feed had already been sneaked in back in July, without any fanfare. We wonder if this new website design (not very different from the old one) has actually been properly security penetration tested, following the Cross Site Scripting vulnerability demonstrated back in July. - see Which was worse - the MI6 website spelling mistakes or the MI5 website Cross Site Scripting vulnerability ? Note how many blurred images, or people with their backs to the camera, or with their faces otherwise obscured etc. there are in this selection of graphics from the website, which seem to depict the organisation and its targets and the general public as "shadow people". Terrorism Threat Level SEVERE reduced to SUBSTANTIAL - what is anyone doing any different from before ? The current threat level is assessed as SUBSTANTIAL (as of 20th July 2009 - see threat level history for previous changes). This means there is a high likelihood of future terrorist attacks and indicates a continuing high level of threat to the UK. See The UK's threat level system for more information on what threat levels mean, who decides the level of threat and how the threat level system is used. The Government continues to maintain a state of heightened readiness in response to the threat from international terrorism. It remains the Government's policy to issue warnings or advice if this ever became necessary to protect public safety in the event of a specific and credible terrorist threat. The threat of international terrorism comes from a diverse range of sources, including Al Qaida and associated networks, and those who share Al Qaida's ideology but do not have direct contact with them. A threat could manifest itself from a lone individual or group, rather than a larger network. Domestic terrorism related to Northern Ireland, principally from dissident Irish Republican and Loyalist terrorist groups, also remains a threat. The terrorist threat can take a number of forms, as terrorists may use a variety of methods of attack to achieve their objectives. These may include explosive devices, firearms, missiles, kidnapping, infiltration and electronic attacks. See the Centre for the Protection of National Infrastructure (CPNI) (new window) website for practical advice on how to defend against these threats. This page has been produced in consultation with the Joint Terrorism Analysis Centre (JTAC). It will be regularly reviewed and updated. 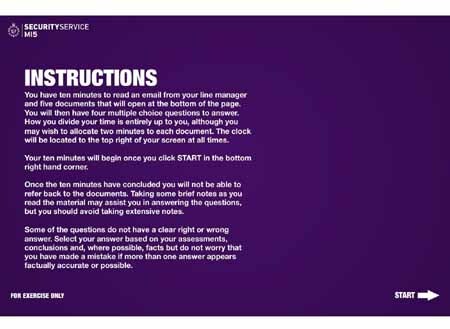 Whilst every care has been taken in preparing this summary, the Security Service accepts no liability for any statement contained therein (see our Content Disclaimer). What exactly is anyone doing now , which is any different from before ? The general public is still being told to Obey and Report Anything Suspicious, as always..
MI5 and the terrorists are unlikely to be doing anything different from normal either. Note the importance given to the Content Disclaimer ! The Security Service shall have no liability to any person for the accuracy or contents of the security advice published on this website. The Security Service assumes no responsibility to any person. No warranties are given. No liability is accepted for any inclusion or omission herefrom or the absence of any other information or matter. Furthermore, no liability or responsibility is accepted for any further advice given or omission to give further advice, prior to or subsequent to the advice published on this website. does not include any mention of the change to the Terrorism Threat Level.